Sugar Nation—who has been lying to you? For my diabetes post this week, I wanted to share a book review. Let’s go ahead and get the disclaimers out of the way. I’m not a dietician, diabetes expert (outside of my own body, which is one big experiment), nor am I some government hater…not completely… or conspiracy theorist. I don’t claim to have all the answers and neither does the author. This is strictly my opinion. So whatever clerk is sitting at the ADA cyber floor and monitoring hate posts, consider this me breaking out the free speech card. Jeff O’Connell is the current editor-in-chief at Bodybuilding.com and former editor-in-chief at Muscle and Fitness. He was diagnosed with diabetes and it was a shock to him because he was skinny. Right off the bat, this caught my attention. A few weeks ago, I posted about my own diagnosis when I was at my peak health and weight, and had been most of my life. But like Mr. O’Connell, we can’t pick out which attributes we inherit from our families. I am glad I got the gift of snark from both parents. We make sarcasm an art form. 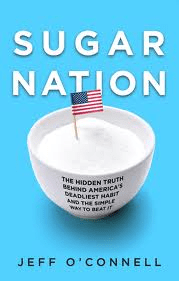 Sugar Nation is part autobiography and part documentary. He details his father’s struggle with the disease, his own mental and physical struggles, and his lifestyle changes to combat the disease. He also details his battle with reactive hypoglycemia which is just now gaining some publicity. What really spoke to me was something that has bothered me for a while. Why does the American Diabetic Association push a diet that is considered high or moderate carbohydrate? Why did they wait until 2006 to recommend STRENGTH TRAINING as a form of exercise to control blood sugar? The answer to these questions may step on some toes. Good thing I don’t care. OH! but they do have a tab for Food and Fitness. This is where they recommend a diet with low protein, high carbs. If you have not set up a meal plan yet, we suggest eating 45-60 grams of carbohydrate per meal as a starting point. This would mean you would be eating between 135-180 grams of carbohydrate throughout the day. What is wrong with this picture? Those carb totals are insane. And even more alarming is the rate at which many doctors prescribe medication first. Anybody who thinks all doctors are looking out for your best interests are floating down that river in Egypt. I was very fortunate that my doctor told me to keep doing what I was doing with exercise, but cut the carbs and wait for my levels to even out. He was right. I had to learn to run again with different fueling options. I don’t always have perfect carb control (anybody notice a theme of cupcakes and bread on this blog..) and I’ll admit that freely. But my doctor nailed it. My A1c was horrible. My fasting was not as horrible. Instead of jumping to metformin, he told me to take responsibility for my own health first. And that is the underlying theme of Sugar Nation. So many people could control their own disease if they are given a chance. I know many people refuse to let go of their foods. I know many people who could have taken 3 months to get a new lease on life, but they were slapped with Metformin and a free visit to a dietician. Something is up at the ADA. Pushing drugs too soon is ridiculous. The rate of diabetes is now a global epidemic. And the vast majority of Type 2 is due to bad diet and lack of fitness. So why wouldn’t intense and correct information on these two things be at the forefront of the message from the ADA? Why are drugs the first choice? Jeff O’Connell raises some very good questions. It is worth a look if you find yourself with 3 extra notches in your belt to hold up your too-big pants staring at the doctor who says “you have diabetes”. It happens to more “thin” people than you think. If it happens to you, grab this book before you grab that prescription. Previous Post: « Why I am training to “just finish” my first marathon? just ordered the book—as a hypoglycemic and health junkie—thanks! !